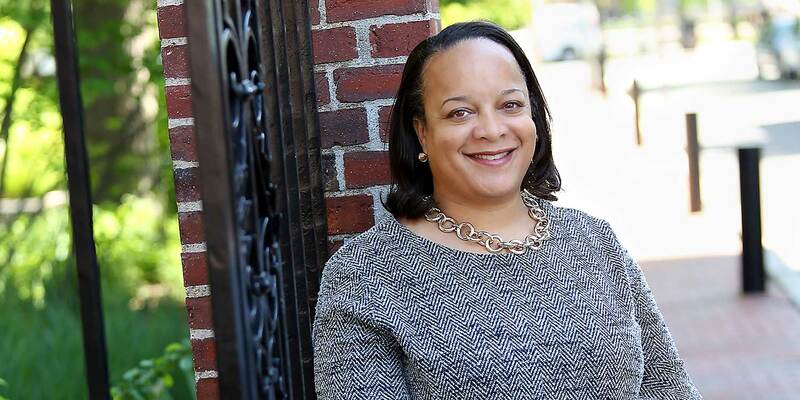 Dean Bridget Terry Long talks about concrete jobs and the influence of her family. What her father wanted was opportunity — for himself and eventually for his two daughters. He got married and moved from the segregated south to Baltimore and later to the Midwest. He got a job at Xerox and worked his way up to a management position while also going to college, two kids in tow. It was looking back at pictures of his graduation when he was 30 and seeing herself in the photos, plus knowing that her mom worked her way through college to become a high school teacher, that made Long realize that there wasn’t just one way to be a student. “I grew up knowing that institutions were more than just good times for 18-year-olds,” she says. It also became crystal clear just how powerful education could be. “Education was the only answer to changing not only the cycle of poverty, but also the ability to take hold of one’s own destiny,” Long said to the Ed School community in May, in a speech given after being announced the new dean. This meant that for Long and her sister, solid jobs were absolutes. “The big goal was for me to become a vice president at IBM,” Terry says. “My father understood corporate pathways as being opportunities for people of color. I grew up with many African American families where dad was in the corporate world and mom was a teacher or a nurse. That was stability; that was getting into the middle class. We had no understanding that there were these jobs where you studied the world and did research. That would have been frightening. That would have been what rich people did. You needed a concrete skill to get a concrete job to get a concrete paycheck.” Joking that she could never have become an art history or music major, Long eventually ended up in economics after a summer program introduced her to what a university economics department was like. This led to Harvard, where she got her Ph.D. in economics. “My parents had absolutely no idea what it meant to get a Ph.D., but it was Harvard so they had faith that it would all work out,” she says. And it did. (Her parents obviously agreed, arriving at the gates of Harvard Yard at 4:45 a.m. on Commencement day so they could get the best seat possible to watch their daughter graduate.) Now 18 years later, Long acknowledges the long road her family has traveled from the days of slavery and sharecropping to her being the first black woman to lead a school at Harvard, and the impact it’s had on her research on access, opportunity, and what it means to be a student. Read a Q&A with Dean Long during her first week.